Such was the size of America, it meant there were lots of ‘local markets’ dotted around the country and not necessarily based on any of the big cities. This resulted in records being released top cater for that ‘local market’ and quite often those burgeoning sales were spotted by bigger companies who stepped in and, sometimes, paid very good money to give these ‘local breakouts’ national distribution. 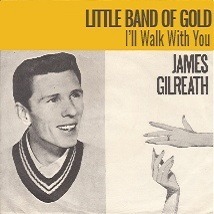 James Gilreath’s “Little Band Of Gold” is one such example. Originally released on a small label called Statue, it was picked up for national release by Joy Records and went on to one place shy of the Top 20 on Billboard’s Hot 100 in early 1963 and topped out at number 19 on the R ‘n’ B chart. Gilreath had been a member of a very popular group in Mississippi called The Nite-Liters, a co-member of which was John Mahalic, the man who played trumpet on the session. The track was produced by Hurshel Wigginton, a member of The Nashville Edition, a group that appeared on many recordings as back-up singers. Gilreath’s luck didn’t last long; the follow-up and subsequent releases, which for some reason credited him as Jimmy Gilreath, failed to emulate the success of “Little Band Of Gold”, leaving Gilreath as one of the industry’s many ‘one hit wonders’. He continued to record spasmodically for a couple of years after leaving the Joy label, but his biggest pay days came in 1967 when Jimmy Hughes took his song “Why Not Tonight” to number 5 on Billboard’s R ‘n’ B chart and in 1975 when Sonny James re-did “Little Band Of Gold” and took it into the Top 5 of the American country charts.